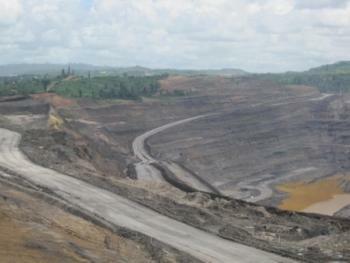 Coal mining is bringing devastation to landscapes and livelihoods in Kalimantan, where a coal-rush is in full swing. Indonesia is now the world's largest exporter of thermal coal - supplying power stations and generating electricity in India, China, Europe and many other countries around the world. DTE is campaigning against UK involvement in Indonesia's coal rush. We need to reduce demand for coal in order to protect livelihoods in Kalimantan as well as reduce UK greenhouse gas emissions. BP currently joint owns and manages Indonesia's biggest coal mine. It has 50% of the shares in PT Kaltim Prima Coal (KPC), a massive open cast mine near Sangatta, East Kutai district, East Kalimantan province. The Anglo-Australian mining giant, Rio Tinto, owns the other 50%. KPC is currently embroiled in a power struggle with the local authorities as, under the initial agreement, this foreign-owned company must sell off 51% of its shares to Indonesian parties .